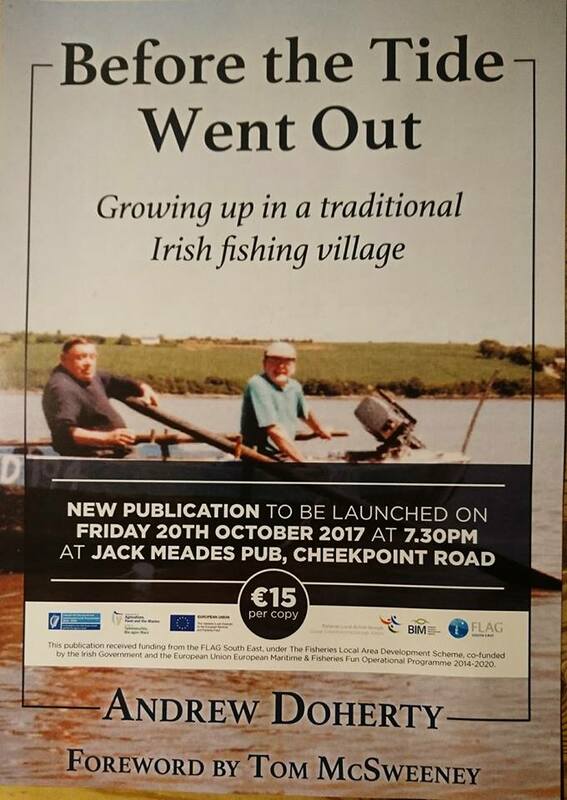 This day next week Friday 20th October I will launch my first book titled Before the Tide Went Out. It takes place at Jack Meades on the Cheekpoint road at 7.30pm and everyone is welcome. Of course launches are something I am very familiar with. Launching punts that is, not books! 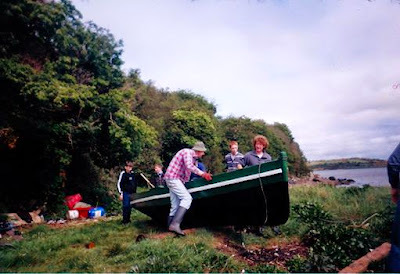 As a child in Cheekpoint there was no greater symbol of the fishing than the punts that we worked the rivers on. In those days they were made of timber, generally larch planks over oak frames. Following the long spring and summer of the salmon and eel fishing boats were heavy having absorbed river water into their planks. The usually needed repairs also. 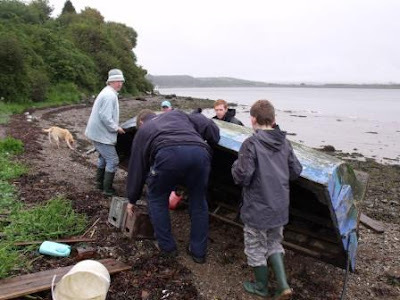 Boats were generally hauled out on some of the high tides such as the equinox springs in late September. 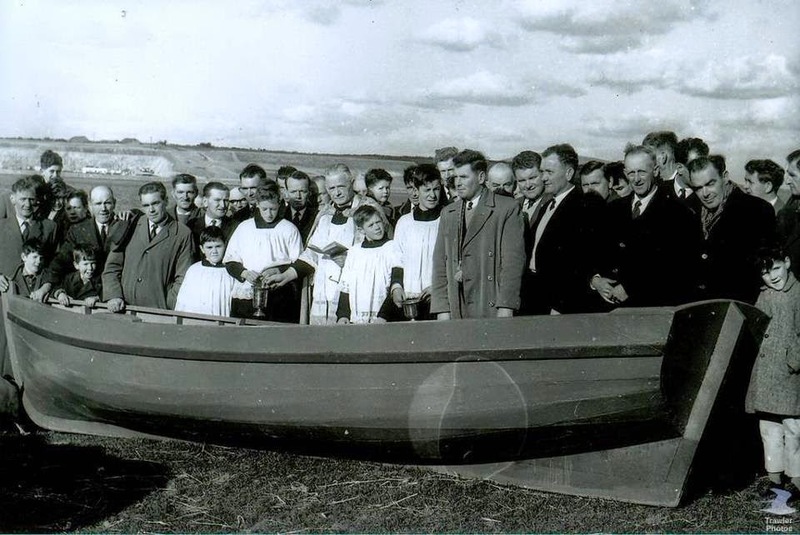 These tended to be a community event, groups of men (and children) gathering to help to drag up the punts from high water and onto the shoreline. Once up, they would be turned over, keel side up and the gunwales raised off the ground with rocks under them to allow the wind blow under and dry them out. Wear and tear on punts could have been simple or more complicated including; keel bands (a band of metal that protected the keel) could be loose or broken following a season of beaching on gravel or stone, natural wear on timber from weather, damage to gunwales from hauling nets or ropes or having to replace timbers or planks, knees, thwarts etc. Other works were guaranteed; touching up damaged or missing caulking and dealing with faded paint work. In the village the Green was the favourite spot to overwinter. The Rookery quay would also have a few boats. Moran’s poles was a favourite of Paddy & Pat Moran, Terry Murphy, Paddy, Christy and Johnny Doherty and Maurice Doherty too. Further along towards Whelan’s Road Charlie Duffin kept his boat and in the next spot Jim Duffin. All of them sadly gone to their eternal rest now except Pat. Ned “Garragier” Power kept his punt and prong down under the house on the strand below Coolbunnia. The barnacles and green moss that would have grown on the boats bottom during the heat of the summer would have died back while upturned. At some stage these would be scrapped off and washed down. Some preferred to do it soon after, others not until they were readying the hull in the spring. There was always someone down at the boats tinkering away at something. As children we loved to come across the men working on the boats. There was always a yarn, maybe a few bob for running an errand or an opportunity to learn some particular skill. Some skills were less appreciated at home than others however. 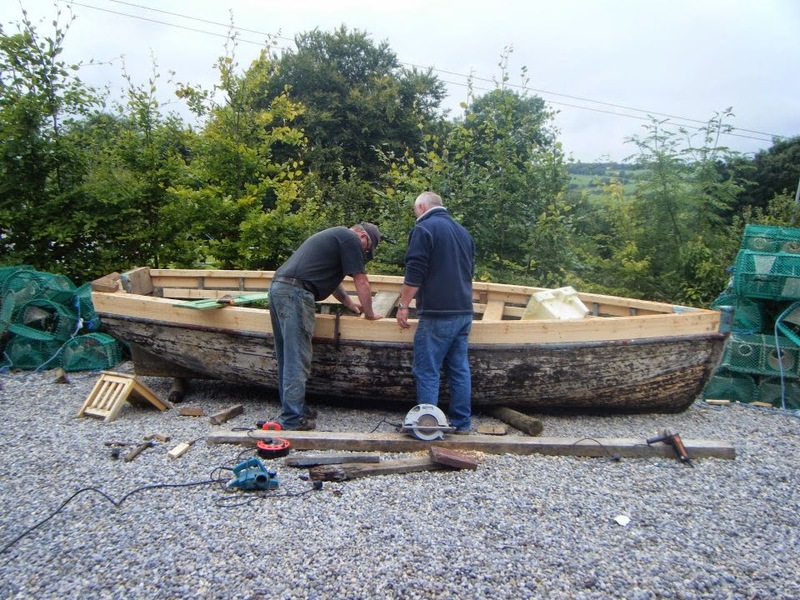 Work in progress on a punt, Sean Doherty and Michie Fortune. Before the boat was turned it would need to be coated with a mixture of tar and pitch to seal the hull. Any caulking that had come undone would be replaced prior to this. Tar and pitch could be purchased from the now sadly closed Johnny Hearne’s on the quay in Waterford or from Dunphy's hardware store in Campile. But people had many sources, and I remember it said that the best you could get was from the Harbour Board, if you had a contact. This would be melted down in a pot or an old paint can over an open fire and you had to be careful that the tar didn’t boil too hot or it could catch fire. The same pot and brush tended to be used from year to year. The brush used would have to be a good one, or it would fall apart in the heat. You needed to be careful with the boiling liquid, as it would burn like hell if it got on your skin. A friend still carries the scar left from an accident, the only relief from which was to run headlong into the river and plunge his hand into the water. Once the hull was tarred it would be left to dry and then the punt was turned over to expose the inside. Then this too would be tarred and finally the gunwales and strikes would be painted inside and out. Each boat had her own traditional colours and a lot of care was generally paid to ensure that the upper paint work looked well. Once all was in order, it was time to launch. This tended to be done a few weeks before the new season started as boats needed time to swell in the water and close up after the planks had dried out and most probably shrunk. Again it was a big event and most boats would go out together to save on time. Repairs these days take place with power tools, so boats tend to come out on a trailer and be towed home to a shed and a nearby power source. 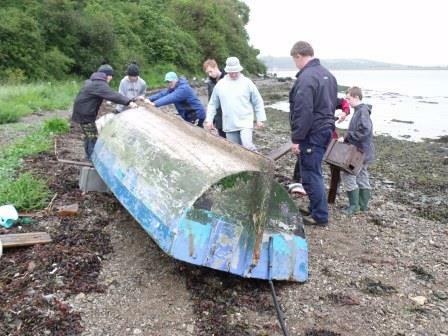 It’s also a fact that most boats these days are fibreglass or are timber boats that have a fibreglass coating. Hence the traditions described above have either died out or are significantly altered and reduced, which when you think about it, is a big loss to a local tradition. This story is an edited excerpt taken from the book. Before the Tide Went Out has been a work of passion for several years now and Damien Tiernan RTE's SE correspondent will be my special guest on the night. Tommy Sullivan will MC the event and we will have someone to speak on behalf of the SE FLAG group who helped me with some of the costs associated with the publication and launch. It takes place in Jack Meades, Friday 20th October at 7.30pm and all are welcome. The book will be available on the night and sells for €15. Tom McSweeney has written the foreword to the book and just this week wrote and produced a podcast explaining why the book is essential reading to anyone with an interest in fishing communities, particularly department officials. If you click on this link and scroll down to the fisheries podcast you can hear it.